I found confirmation of a mini-vision I was given in the summer of 2012 while in prayer for America and it’s leaders. 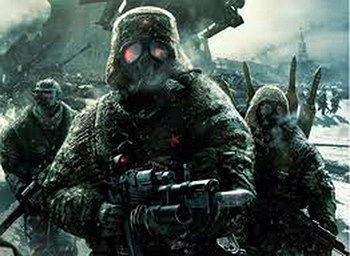 Here is the description of this vision: I saw soldiers, they were dressed with gas masks and eyes covered. They were, and I stress, not friendly, but very cold in their manner and approach. These soldiers had guns, and they were big ones. They were each holding their guns toward people, not away from. They appeared to be aggressively marching or herding the people. I was greatly shaken at what I was seeing. I knew something horrible had happened in America, but I wasn’t sure what. What puzzled me the most was that these soldiers did not appear to be American. Their dress was different, and their behavior colder and more aggressive. Something about uniforms differed, and although I’ve experienced martial law in a time of natural disaster (volcanic eruption), their behavior toward and treatment of the people was not like what I experienced. I asked the Lord what this all meant, but that’s all He revealed, so I’ve left it at that, but the vision is as vivid as it was the day I received it. I haven’t forgotten, and I never will. Now, this year, I am seeing others are speaking forth words about this same thing and not only that, but the fact that there have been 7,000 RUSSIAN soldiers brought in to the US to work together with FEMA, who has been storing up for a “natural” disaster, and many, many people have witnessed these preparations taking place, the vision I was given is confirmed. And now? What does the Lord tell me to do (especially on the heels of a prophecy He has given about America besides)? He instructs me, “Pray for America, for I’m pouring out my wrath upon her. Her sins have are great and have come up before My eyes.” So I say to all who are listening, pray for the harvest of America! Pray for the believers! Pray as you’ve never prayed before! Paula Hodges lives in England and shares many prophetic words she has received from the Lord on her website at churchwithoutaceiling.com.